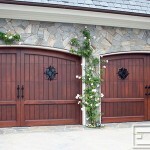 Dynamic Garage Doors are custom-built starting with raw materials such as wood of variant species including reclaimed and exotic woods from around the world. 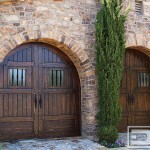 Every layer of our custom garage doors is carefully handcrafted for quality, durability and ageless beauty. Our swing-gate carriage house style custom garage doors look and feel so genuine that you’ll feel compelled to swing them open….surprise, surprise they roll up automatically at the touch of a button from the comfort of your own vehicle! 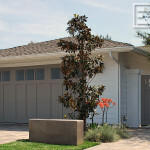 There is no reason to settle for the ordinary garage door options when you can have an extraordinary custom garage door! Share your custom garage door design with us or pick and choose features from our extensive custom garage door collection. From the old world architectural charm we offer hand hewn antique distressing, master custom staining and high grade painting to suit your home’s architectural style. Hand-forged iron hardware add a finishing touch to our rustic or architectural historical custom garage doors from around the globe. 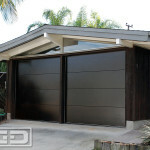 Finer materials such as chrome, copper, glass and composite woods are the benchmark materials that make up our fine-lined Contemporary and Mid Century customized garage door styles. 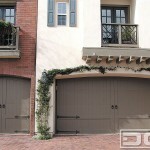 No matter what your taste is Dynamic Garage Door has a style to suit your architectural garage door needs. We specialize in harmonizing your home’s charming architecture and giving a touch of authenticity to your custom garage door that will make your neighbors green with envy! Browse through our categorized architectural door styles to find the perfect custom garage door to suit your home and personal style. Keep in mind that we are a custom garage door manufacturer and the possibilities for custom-tailored designs are endless!